It’s not a sedan, and it’s not strictly a coupe. So what is the Audi RS5 Sportback, exactly? Well, it’s got the tailgate of a long hatchback, the four doors of a typical saloon and the heart of a sports car. It’s related by blood to the hot dog RS4 Avant wagon and the shorter, wider and gnarlier RS5 two-door coupe, as well, so its performance chops are well known… but just how does this odd-bod fit into the RS lineage? At $157,700, the RS5 Sportback sits above the $152,529 Audi RS4 Avant wagon and the $156,229 three-door RS5 coupe, even though it shares all of the basics with its siblings. This includes its 331kW, 600Nm 2.9-litre twin-turbocharged V6 petrol engine, its eight-speed automatic gearbox, centre diff-equipped all-wheel-drivetrain, adaptive shocks, dual-mode exhaust and big brakes. It also shares stuff like LED headlights and taillights, RS-specific sports seat and steering wheel, Audi’s digital dash with bespoke RS content, automatic lights and wipers, inductive phone charging and 20-inch rims. Our Nardo Grey tester ups the ante with $13,800 of extras… of which I reckon $10,900 is pretty unnecessary. The Carbon and Black Pack simply adds carbon body kit parts along with some gloss black and satin silver plastic, and it seems like a silly way to drop more than ten grand. The carbon interior inlays are, however, a nice touch despite the $1000 ask, while Audi’s $1900 Matrix LED headlights are pretty amazing, especially on high beam, and incorporate things like the cool-as-heck scrolling dynamic indicators. The RS5 Sportback’s unique body style means it’s got no real direct competitor, but BMW’s M3 Competition ($156,529) and Mercedes-AMG’s $160,900 C63S four-door sedans are the closest. The RS5 trumps both for driven wheels, with both its rivals rear-wheel-drive only, while the Merc’s interior is closest to – but not superior to – that of the Audi. The RS5 Sportback is a truly unique high-performance car, if for no other reason than its large hatch area. Shared with cars like the Skoda Octavia and Holden Commodore, the tailgate lifts to reveal 480 litres of cargo space behind the seats (the C63S, for example, has 360 litres), and a massive 1400 litres when the 60-40 split/fold seats are dropped. It’s not a flat load space, but it does the trick. 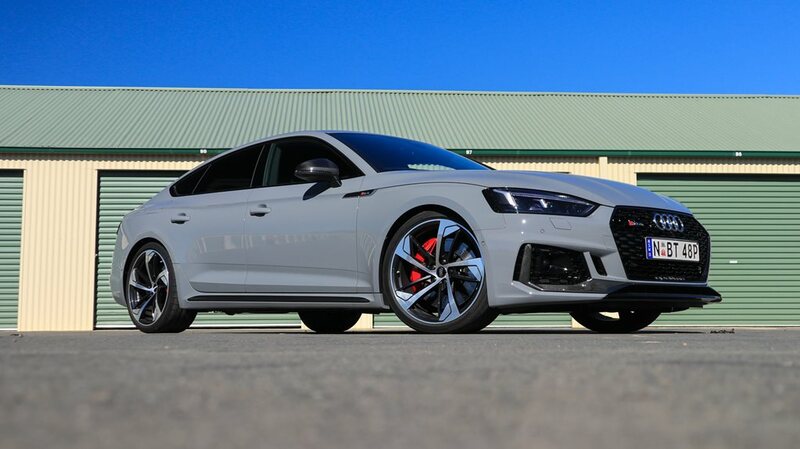 Audi has equipped the RS5 with all of its safety tech, including a traffic-jam capable adaptive cruise control system, two ISOFIX baby seat mounts, high- and low-speed AEB with pedestrian detection. Early-batch RS5 Sportbacks were, however, equipped with six airbags (front and side bags for driver and passenger, curtain bags first and second row). Later models were specced with an additional pair of second-row side airbags. Regardless, the RS5 Sportback still earns a maximum ANCAP five-star rating. Audi – along with its premium competitors – still trails the industry when it comes to warranties, offering three years/unlimited kilometres, along with 12 month/15,000km service intervals. The RS range, though, doesn’t fall under a fixed-price service plan. Against a combined fuel economy claim of 8.7 litres per 100km, we recorded a real-world figure over 510km of 9.3L/100km, which is pretty commendable, given my liberal use of the loud pedal wherever (mostly) appropriate. The wheelbase figures of the RS4 and RS5 Sportback are reasonably close (2832 v 2826mm), and the Sportback is the longest of the two - and 16mm narrower to boot. Back seat space is okay leg- and feet-wise, but the swept roofline gobbles up some headroom, as does the sunroof’s unique headliner. Upfront, though, the RS seats are low-slung, grippy and comfortable, with adjustable side bolsters and even an extension for the seat base on the driver’s side. The small, chunky steering wheel feels great underhand, though the paddles feel a little cheap and plasticky. It’s a strange one, this RS5 Sportback. On paper, anything with two turbos, all-wheel-drive and 331kW ought to be as fun as a barrel of monkeys at an Italian wedding… but it’s not quite all there for me. The way it delivers its power is prodigious and impressive, but it really does its best work when the national speed limit has come and gone. The exhaust can be adjusted between sporty (read thrummy and droney at certain revs) and comfort (aurally read non-existent) noise levels, but it’s the suspension set-up, for me, that’s the least convincing part of the package. In the softest of its three settings, the adaptive shocks are far too underdone for anything but sub-60km/h work, while the firmest setting creates a brittle ride that still feels underdamped. The auto setting is the best of the three, but there’s artificiality, like a sense of disconnection, between what the driver feels, the steering wheel and what’s happening on the road when you’re leaning on it a bit. The RS5 tends towards understeer, which is safe and stable, but it dulls the RS message to the point where you wonder whether an S5 might be a better car overall. Plug it into Comfort mode, and the beautifully appointed RS5 certainly doesn’t disappoint for interior comfort, ease of use and sheer presence, but excess road noise from the 20-inch tyres on coarser roads spoils the ambience at times, and the eight-speed auto can also be caught on the hop when it’s asked to schlep around town at dawdling speeds. The RS5 Sportback is a deliberate step apart from more brawny, bruisy German rivals, but it also isn't as cossetting and comfy as a like-minded Lexus. It offers luggage versatility, excellent fuel economy and a broad performance envelope for the money… but it’s just not as convincing as its dynamic looks might suggest.